Seasage Drive, Delray Beach, Florida. In the Old Florida beauty of Seagate, a sought-after beachside neighborhood, this quiet setting on a desirable street right by the Intracoastal is within walking distance of the Atlantic Dunes Park beachfront and only about a mile from Atlantic Avenue. 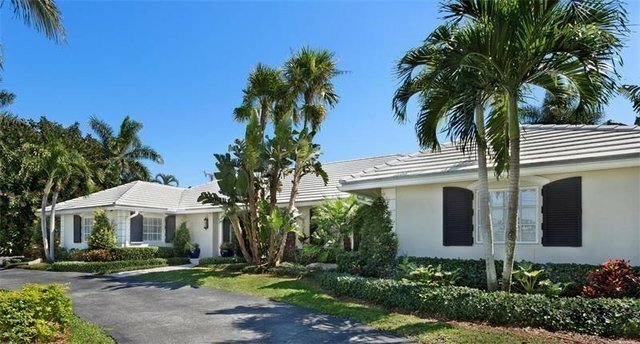 Picture-perfect as an inviting realm for indoor/outdoor living, this single-story Florida-style residence was beautifully renovated in 2009, bringing a relaxed transitional vibe, and has since been meticulously maintained and updated with other features including a new roof in 2013. Set back from the street on a lushly landscaped semi-circular drive, this light-filled residence opens to a tranquil backyard oasis bordered in leafy foliage, with a lovely garden pergola on the lounge terrace around the sun-splashed Diamond Brite pool. The comfortable floor-plan totals 3,682+/- square feet with three generous bedrooms, three and a-half baths, walk-in closets, and a two-bay garage. You will discover new wood flooring, and many windows fitted with plantation shutters. Amenities include the whole-house generator and Aqua-Pure five-stage water filtration system. Electric storm shutters provide windstorm protection and security. Spacious and inviting, the tray-ceilinged living room overlooks the lush pool area through the airy window wall of the solarium-like family room which opens to the terrace and has warm Mexican tile floors. Flowing off the living and family rooms, and also opening to the pool terrace, the beautiful dining room adjoins the gourmet kitchen outfitted with custom cabinetry, Ceaser stone counter tops, bamboo-look glass tiled backsplashes, an island with five-burner Bosch gas cook-top, and other KitchenAid appliances. Overlooking the tropical gardens by the pool, the serene master suite features a customized walk-in closet and private bath with glassed shower and bay window. The second bedroom has an adjacent bath, while the third bedroom, off the foyer, has an en-suite bath.